I see…and so do the birds! In the last few weeks while out and about I noticed something odd, almost subconsciously. While waiting in a car in a small village on an island located south of Funen in Denmark I made my first observation. In the village on the island of Tåsinge I noticed a sticker on a window above a door leading into a house. It was black and outlined a bird of some sort. Interesting decoration I thought and it quickly slipped from my mind. 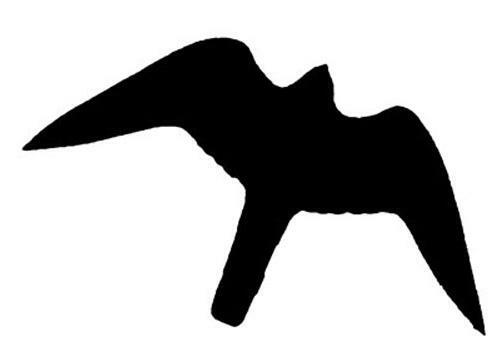 A few days later I was walking through a long glass corridor in the University of Southern Denmark in Odense and again I noticed a very similar black silhouetted bird sticker. This time it was on a large glass panel, alone. I was on route somewhere at the time and again the observation quickly slipped from my mind. Today while browsing on-line for some Christmas gifts (on the Irish Peatland Conservation Council website http://www.ipcc.ie) I came across another similar sticker and finally the penny dropped! These large bird stickers are designed to mimic birds of prey to deter small birds (their prey) from potentially dangerous glass windows. Interestingly they are available in black and red, depending on the type of glass and how the bird may view it! Simple, but brilliant!